Determine the relative abilities of simple shapes to hold weight, and discuss the role of shapes in man-made structures. flat strong cardboard, about 15cm X 20cm, one per student pair. I made them from cereal boxes. Show the students a photo of a bridge or other man-made structure. Point out the shapes made by the steel girders (e.g. triangles in the Burrard Street Bridge, diamonds and rectangles in the Port Mann Bridge). Explain that the shapes are made during construction to make the structure as strong as possible. Tell the students they will be testing different shapes for their strength. Show the students how to make a triangle and a square from a sheet of paper and tape, how to lay a platform between two identical shapes, and add a load to the platform. Do not reveal what will happen. Students make two identical triangles and two identical squares by folding a letter sized sheet of paper and taping it closed with pieces of masking tape. If there is time, they can also make two of another shape that they choose (e.g. circle, pentagon). This requires some skill to accurately assess where to make the folds, and to tape the edges together so that there is no overlap. If the students are unable to do this accurately, the teacher should do it for them. 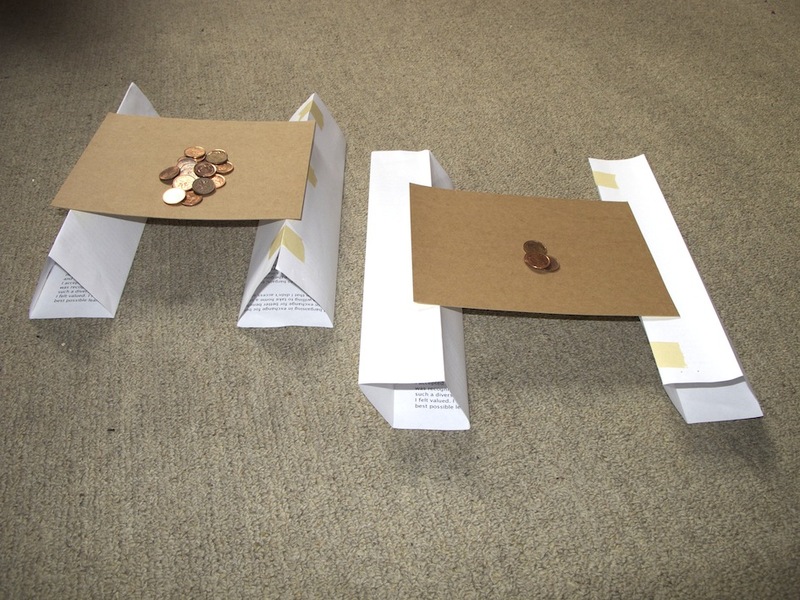 ￼Students test the strength of each shape by laying a cardboard platform between two of the same shape, adding a small container to the centre of the bridge, then adding pennies to the container until the shape starts to collapse or distort. Students record the number of pennies added to a shape before it distorts or collapses. (See the attached worksheet). 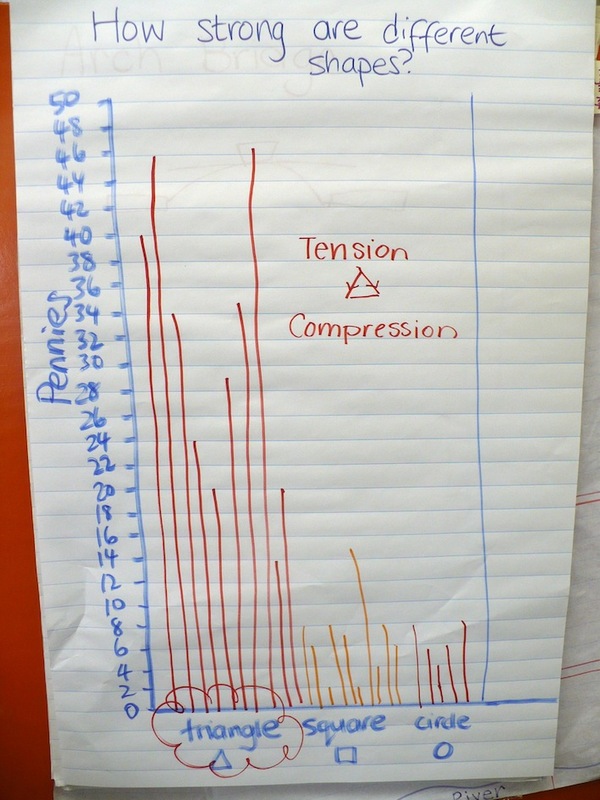 As a class, add all results to a class graph, with number of pennies up the side of the graph and the shapes along the bottom, and find out which shape is the strongest. It is expected that the triangle would be the strongest (see image for one class' results). (This graph is a good opportunity to show students that sometimes data is a little messy, and one might need a lot of data points before seeing a pattern emerging. Explain why the triangle is the strongest shape: the sides of a triangle are a fixed length, so as a force is applied the angles of the triangle cannot change, so maintaining the triangle’s shape. A triangle will fail when either the sides buckle (as probably happened in this experiment), or when the joints break apart. When a load pushes down on the triangle, the two top sides are under compression as the force from above pushes down on them. The bottom side is under tension as the ends are pulled apart. (So in construction the bottom side that only experiences tension can be made of a lighter material than the upper two sides that must be more rigid to stand up to compressive forces). In the case of the square, the angles can change even when the length of the sides stays the same - it is easily pushed into a diamond shape. It was challenging for some grade 2s to make the shapes accurately enough to really compare them - sometimes the sides didn't meet, or overlapped, or the tape was reinforcing sometimes. Need to try it with older students to see if it is a viable activity.